March 30, 2011 - Garmin announced the Garmin G2000, a premium touchscreen-controlled integrated flight deck designed for high performance piston aircraft. With this advanced system, pilots will have many of the same advantages found on systems like the Garmin G3000, which is designed for Part 23 turbine aircraft, or the Garmin G5000 that is being designed for the crew-flown business jet market. ?Pilots of high performance piston aircraft value speed and capability, and we?ve designed the G2000 to meet their needs,? said Gary Kelley, Garmin?s vice president of marketing. ?This new integrated flight deck gives pilots rapid and intuitive access to vast amounts of flight, system, and sensor information, and also gives the pilot the ability to tailor how that information is presented. The G2000 will provide a premium option for high performance piston aircraft and is an excellent complement to our G1000 integrated flight deck.? 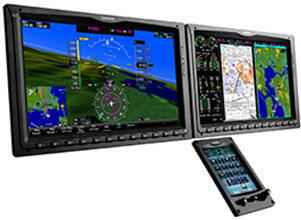 The G2000 is designed to allow pilots to tailor the information presented to them. It features WXGA high resolution, wide aspect ratio displays (12-inch or 14-inch diagonal). The landscape oriented MFD has multi-pane display capability that allows multiple pages to be viewed side-by-side on the screen. Therefore, pilots can simultaneously view maps, charts, aircraft systems synoptics, TAWS, traffic systems, flight planning, datalink weather, on-board video and more. As with the G3000 and G5000, the G2000 utilizes the GTC 570 vehicle management system, a 5.7-inch diagonal touchscreen controller that uses a desktop-like menu interface with intuitive icons. The GTC 570 allows for full control for radio management, audio management, flight management, weather systems management, synoptics, and other vehicle systems. The touchscreen also enhances ease of use through common sense functions like ?back? and ?home? that let pilots quickly retrace their steps or return to the home screen. The GTC 570 vehicle management system uses patent pending, infrared touchscreen technology, audio and visual feedback, and animation to help pilots know exactly how the system is responding to their input. The GTC 570 also incorporates three conventional knobs at the bottom of the display: a volume control knob, joystick knob and dual concentric knob for data entry. Pilots may choose to use the knobs instead of the touchscreen to enter information. The G2000 has industry leading features that pilots have come to expect from Garmin such as a world class digital, dual channel, fail passive auto flight system. The autopilot includes features such as coupled wide area augmentation system (WAAS) approaches, vertical navigation, and flight level change (FLC). The G2000 also offers a multitude of standard and optional features including Garmin?s Electronic Stability and Protection (Garmin ESP), 3D audio, global connectivity and weather through Garmin?s GSR 56 Iridium transceiver, and many new systems integration capabilities. Garmin?s SVT is also available and presents near life-like 3D depictions of terrain, obstacles, traffic and the runway environment so that the image on the display replicates what pilots would see outside the cockpit on a clear day. SVT works seamlessly to alert pilots of potential ground hazards by displaying terrain and obstacles which pose a threat to the aircraft with appropriate TAWS alert coloring, as well as voice alerts. SVT also includes pathways (or Highway-In-The-Sky) that are depicted as 3D ?flying rectangles? and help pilots stay on course when flying en route legs, VNAV legs, GPS/WAAS vertical approach procedures, ILS approach procedures, and arrival and departure procedures. The G2000 avionics suite has the capability to incorporate synoptics (graphical systems displays), Garmin?s SafeTaxi, and electronic charts like FliteCharts and ChartView, which simplify operation, enhance situational awareness, and increase safety during flight and when taxiing. Garmin SafeTaxi includes over 950 U.S. airports and helps pilots navigate unfamiliar airports while taxiing by identifying runways, taxiways, runway incursion hotspots, and hangars, as well as the aircraft?s exact location on the field. Garmin FliteCharts is an electronic version of the AeroNav Charts (formerly known as the NACO U.S. Terminal Procedures Publication) and lets pilots quickly find and view Departure Procedures (DP), Standard Terminal Arrival Routes (STARs), approach charts, and airport diagrams on the MFD. Garmin ChartView is an electronic version of Jeppesen?s extensive library of charts and airport diagrams are displayed directly on the G2000?s MFD. Garmin expects to receive certification of the G2000 in 2011, and it is currently planned to be offered directly from aircraft manufacturers on new aircraft models.